UV for Packaging. Attributes of UV Appeal to Package Printers. Digitally printed packaging represents a major opportunity for manufacturers looking to expand into new markets. Features inherent to UV LED and UV-curable inks—including immediate dry time and enhanced adhesion characteristics with many types of media further the availability of extended color gamut, especially when white is considered—add value to packaging applications. Above: The Canon Oce Arizona 6100 High Flow Vacuum Series is ideal for corrugated packaging material. UV-based inks provide a variety of advantages, which translate well to package printing. “Going back to the early days of UV inkjet—before 2000—it was all about getting the ink and printhead to work together reliably so that the integrators could build some hardware around the printhead. 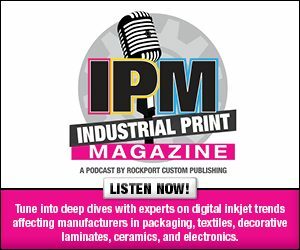 Today’s ink must cure faster, respond to pinning, run in faster systems, reliably print with smaller droplets, work in high frequency printheads, be compatible with new media types, and the list goes on,” shares Phil Jackman, global product manager, digital, Sun Chemical Corporation. He points to a variety of advantages of UV inks including instantaneous dry time, excellent printhead open time, high productivity, reduced printhead maintenance intervals and longer life, reliable jetting, wide media compatibility, inherent adhesion performance, wide color gamut, proven ink technology, reduced energy consumption compared to drying of water-based inks, and compatibility with heat-sensitive-media—especially UV LED cured. “One of the biggest advantages of UV inks for digital packaging is the substrate versatility, often without use of a primer,” says Mike Barry, product marketing manager, Fujifilm North America Corporation, Graphic Systems Division. Juan Kim, CEO, Valloy Incorporation, agrees, and says that UV inks bond to various packaging substrates strongly these days, for both flexible and rigid applications. Furthermore, special color inks like white, varnish, silver, or fluorescent are available. White ink is another advantage. “White ink opens up the possibility of printing on surfaces that range in color, this includes metallic foils,” agrees Michael Maxwell, senior manager, Mimaki USA, Inc. The dry time of UV inks is one of its biggest advantages. With the use of UV and UV LED lamps, output printed with UV inks is cured instantly. However, UV LED curing also offers the benefit of reduced heat and energy consumption. “The marriage of UV or LED lamps to ink combination is imperative to the UV printing process,” notes Barry. According to Kim, UV ink curing is more sophisticated than other processes. “UV light wavelength and power can determine cured portion of droplet, curing speed, and bonding strength. Before a package is ready for the mainstream, it must meet several requirements. This includes shelf appeal and life, enhanced communication, recyclability and sustainability, and weight considerations. “Also consider the complex regulatory landscape as the industry strives to make food packaging safer,” shares Jackman. Several feature sets are attractive for manufacturers looking to produce packaging applications. “Additionally, some ink manufacturers are developing multiple inks that support more specific applications, for example, different varieties from rigid to flexible, each one specifically designed to meet an application demand,” explains Maxwell. While UV ink adheres to many substrates without the need for special coatings or primers, these solutions do play a role. Hutcheson adds that depending on the material being printed and the ink’s ability to adhere to that surface, certain packaging applications may require a pre-treatment. She says for example, some packaging materials feature an extra slippery surface or surface that doesn’t provide the ability for the ink to grab. Pre-treatments help with adhesion. “Whether or not pre-treatment is required for the application, UV inks are very receptive to pre- and post-coatings. This makes UV inks ideal for most packaging applications,” shares Barry. “There are some grades of ink that vendors claim do not need primers. However, it is safer to use primers for certain substrates,” suggests Kim. One major consideration in packaging is its use with food and beverage goods. Packaging that makes direct or indirect contact with food is a complicating factor for production. Mike Barry, product marketing manager, Fujifilm North America Corporation, Graphic Systems Division, points out that different migration level properties and curing technologies are being tested to make UV ink more viable for food safe packaging. Deborah Hutcheson, director of marketing, Agfa Graphics, says Agfa is committed to the research, manufacturing, and testing of its UV ink solutions. “Our ink portfolio includes low-migration UV ink for food and pharmaceutical packaging applications,” she says. Low-migration ink does not move from the package to the food product. Phil Jackman, global product manager, digital, Sun Chemical Corporation, points out that one of the main priorities for brand owners, converters, and customers is compliance and the issue of migration. Once mainly concerned with conventional printing, low migration and compliance are also important factors in digital printing and if not handled correctly, could have potentially severe consequences, such as damage to a brand’s reputation and risks to consumer health. He says during the packaging design stage, particular attention is spent to ensure the correct packaging materials are used to protect the various food products. “The selection of inks and coatings are equally important. To ensure Sun Chemical inks meet the necessary requirements and legislations, there are several factors that need to be considered, including an understanding of the legislation that regulates package printing, a knowledge of migration and the prescribed limits, and a responsibility for ensuring that packaging is correct for its end use utilizing correct testing protocols through all key players on the supply chain,” continues Jackman. Several areas of packaging benefit from UV and UV LED printing equipment. While there are some challenges to consider, this ink’s many advantages make it an attractive option for packaging applications.